Class Format: On-demand teleclass to take anytime, at your convenience. You will receive links to 4 hours of MP3 recordings (from a live class which includes the questions, comments and interactions of the participants with the instructor) and PDF’s containing 13 pages of handouts. Instructors: Panel discussion featuring Dr. Karen Randall, DVM of Solace Veterinary Animal Hospice and professional animal communicators Kristin Thompson and Carol Schultz. Moderated by Teresa Wagner. Who Should Attend: This class is ideal for anyone who wants to further understand what animal hospice is and is not, and to benefit from emotional, spiritual and practical support regarding preparation for and being present with our animals near the end-of life period of time. Particularly helpful for veterinary professionals, counselors, therapists, animal communicators and other animal care professionals who want to support others through the emotionally challenging time of anticipatory grief. At the first indication of a serious health condition with our animals, we often gear ourselves into action to find and provide the best possible care for them. It is often a time of exploring every potential treatment known for the condition, a time of moving all energies toward physical healing. It is a time of hope. In the instances when the time comes that it is clear that our animal’s condition will not heal and is terminal, we are then presented with the painful challenge to surrender to what we cannot change—that our beloved animal will die. This time of animal hospice can feel like a time of helplessness. This shift from providing the best possible quality of life to the best possible quality of end-of-life care is an essential one that our animals deserve. However, it compels us to face our own pain rather than run from it. Perhaps, this is the emotional core of hospice for us: acceptance versus resistance of the impending death of our loved one, and acceptance versus resistance of our own emotional pain of anticipatory grief. This energy of acceptance gently and significantly reduces emotional suffering and invites in the presence of peace and grace during the time of animal hospice. 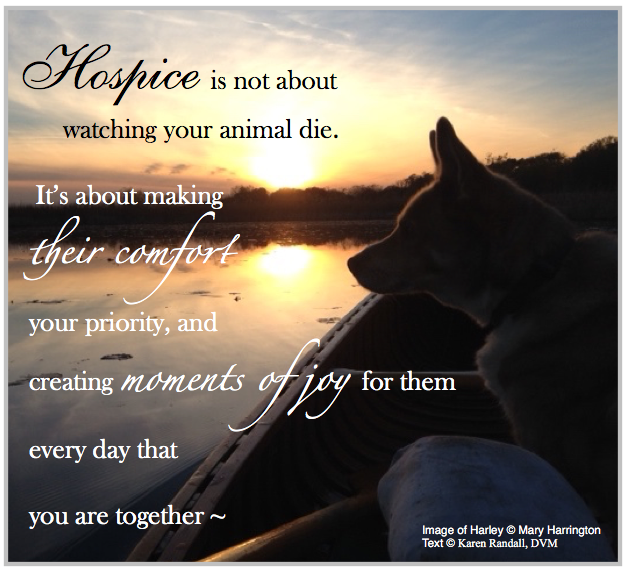 It opens the door for what Dr. Karen Randall of Solace Veterinary Hospice calls moments of “joy therapy” for every day that we have left with our animals. It can be hard to come to such acceptance and to not be overwhelmed by our anticipatory grief. Preparing to say goodbye to someone we profoundly love is not easy. We all need loving support and practical assistance during these times. In this class you will receive guidance for both practical issues of physical care and the emotional and spiritual aspects of providing hospice care for your animal loved ones. You’ll learn specific guidelines and practical tips to help you through the sacred time of hospice with your beloved animal and hear stories about real people and animals and the animal hospice journeys they have experienced. You may also benefit from the related classes on Flower Essences for Illness, End-of-Life, Caregiver Stress and Healing Grief and Understanding and Preparing for Euthanasia. not just myself. . .
and being truly willing to let go. Does animal hospice involve only home euthanasia service, or is it more? Specific things we can do to make the situation the best it can possibly be for the animal and the person; being aware of things that are not helpful to the animal. What physical things do we need to be prepared for during the end of life period for our animals? How can we work best with our animals’ veterinarians during this emotional and stressful time? Advice for those who create a team of multiple service providers (i.e. western vet, holistic vet, oncologist, acupuncturist, animal communicator, energy healer): how to manage this to make it work harmoniously and to derive and share the important information for the sake of your animal. attempts to push us into euthanasia when we may think it’s too soon. Or when we feel pressured into doing a very expensive medical treatment that is beyond our budget capability, or feel guilty when we can’t afford certain treatments or procedures. This animal hospice class was extremely informative from all perspectives. I took it mainly because because I have had to say good bye to five of my best friends. I had no idea about animal hospice and I wanted to know more about exactly what, who, where, etc. was involved. I was very impressed with the overall class! So timely for me, and Kristin, Carol and Teresa all provided very compassionate and gentle guidance to navigate these very difficult and emotional waters. It was just what I was hoping for. 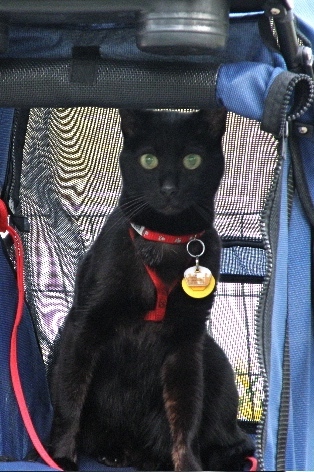 It is the perfect class for someone who has just had a close animal friend transition or is about to have one do so. It gives you some of the medical options and things to keep in mind as well as how to deal with it on both an emotional and spiritual level. I would definitely recommend this class to others. The most positive experience was listening to Dr. Randall because I am hoping to get into animal hospice work and possibly open a hospice in my area. I feel so much more prepared now for when the hospice time comes for my animals. I thought hospice was a “place” and now understand it is a philosophy of care. I don’t look forward to the day when this comes for my little ones, but I feel I now have support, knowledge and tools to help me. Thank you! I especially enjoyed part 2 from the animals perspective. I am a animal Reiki practitioner as well as a person who has had to make some tough decisions recently regarding my animal companions passing. I found the class to be extremely helpful. It was very informative, understanding, insightful, compassionate, honest, and helpful. Highly recommend. I feel SO much more prepared for the next time I face one of my animals dying. Of course I dread it. I think we all do, but now I am not so scared. I will always be sad and grief stricken, but now I just feel so much more of an understanding of what I can do for both my animals and myself during these times. Dr. Randall, Kristin, Carol and Teresa were all in their own way so helpful to all I learned. I liked the panel discussion method. They all had varying experiences which enriched my learning. Thank you! I thought animal hospice meant you would never use euthanasia, even if your animal was in terrible pain. I was very relieved to learn that this is not the case. I learned so much from Dr. Randall and the others. I also learned so much about how we can, and should, listen to our animals during these times, and to trust that because of our bond, if we are quiet and trust ourselves, we will know, we will somehow sense, what out animals want. I can’t thank you enough for this class. and emotional stresses of dying.